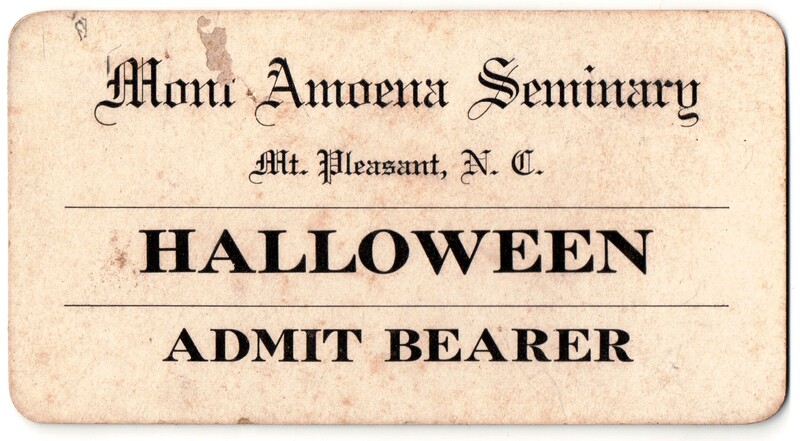 Admission ticket to one of Mont Amoena’s grand annual Halloween receptions. Undated. The Concord Times (Concord, NC), 13 Nov 1903, p. 2. Having notified the mayor, chief of police and the chief of the fire department that nothing harmful was contemplated, the ladies of the Seminary proceeded to observe Halloween Saturday night, 31st. We were not permitted the choice of viewing the spectacular scenes, guards having been placed at the several entrances to the grounds with positive orders to admit no one of masculine appearance. Ghosts of historic renown, form ages long since past, rose from their slumbering places and passed in grand review before an astonished an awe stricken audience. The party was nothing short of a grand success from a ghostly point of view. The Concord Times (Concord, NC), 1 Nov 1904, p. 2. Miss Bessie Heilig will entertain a number of her friends at a Halloween party Monday night. Extensive preparations have already been made by slaughtering twenty pumpkins. The Concord Daily Tribune (Concord, NC), 6 Nov 1905, p. 2..
You don’t catch the young ladies of the Seminary losing any good time that may be coming their way. With the general public, Halloween passed by unnoticed, but not so with these student girls. They celebrated with a grand feast, and had planned to indulge in all sorts of superstitious observances but a sufficiency of pumpkins and candles could not be obtained. The Concord Daily Tribune (Concord, NC), 1 Nov 1909, p.1. The young ladies of Mont Amoena Seminary are devotees faithful and true of Halloween costumes with all the attendant witchery and weirdness. This fact was thoroughly emphasized in their annual celebration Saturday night of this famous event. This proved to be one of the real events of social life in student circles. A number of invitations were issued to friends in town all of whom enjoyed the novel diversions both appropriate and amusing that the young ladies had prepared. Charlotte Observer (Charlotte, NC), 8 Nov 1909, p.8. Mt. Pleasant, Nov. 6. – One of the most enjoyable events of the season was the Hallowe’en party given by the faculty and students of Mont Amena [sic] Seminary Saturday night to invited friends including the faculty of the institute. A unique program was rendered which was highly appreciated by all present. The witches were decidedly bewitching, so much so that several of the students fell victims to the subtle influence unwittingly exercised. The Concord Daily Tribune (Concord, NC) 2 Nov 1910, p.1. … The young ladies of the town gave their young men friends a most delightful and, we are advised to say, enthusiastic Hallowe’en party at the home of Miss Ruth Misenheimer, Saturday night. Witches, spooks, hobgoblins, pumpkins and the like blended in proper harmony to make an evening not soon forgotten by those who were present. The Concord Daily Tribune (Concord, NC), 1 Nov 1912, p.1. Juniors Entertain Seniors and Sophomores. The Junior class of Mont Amoena Seminary entertained the Senior Class, of the Seminary, and the Sophomore Class and the presidents of the Freshman and sub-Freshman classes Wednesday night at a Hallowe’en party. The guests were met by the old witch and her followers, directed to the fortune teller’s tent, etc. Then followed games in which the fate of all were revealed in many ways. The refreshments were werved in pumpkins, served in a room which had been transformed into a forest. All sat on the floor. Ghost tales were told. Decorations were in keeping with Hallowe’en. S.
The Concord Times (Concord, NC), 6 Nov 1916, p.6. … Miss Temperance Ritchie was hostess at a Hollowe’en masquerade party on Saturday evening. The lawn was appropriately decorated and Hallowe’en games were indulged in, after which the hostess served refreshments. Those present were Misses Elizabeth Foil, Virginia Solomon, Lela Beaver, Mary Kindley, Virginia Schenck, Edith Moose; Messrs. Hoy Moose, Joe Banks McAllister, George McAllister, Dan Kindley, Edward Landham, Gilbert Heilig, and Hoy Stamper. The Concord Daily Tribune (Concord, NC), 27 Oct 1917, p. 4. … The Hallowe’en frolic at the Seminary last evening was an event long to be remembered by the young folks. Very elaborate and artistic decorations formed an appropriate setting for the fantastic dances of the witches and goblins, while ghostly gures [sic] flitted in and out. Hot chocolate and sandwiches were served in the gymnasium, which was beautifully decorated. The Concord Times (Concord, NC), 6 Nov 1919, p.5. …There was a Hallowe’en party and at the same time, the birthday party of Miss Wannie Cress at her home on Saturday evening, November 1. The house was beautifully decorated and light refreshments were served. The Concord Daily Tribune (Concord, NC), 31 Oct 1922, p. 3. Mt. Pleasant, Oct. 30.-Last Friday evening the students of Mont Amoena Seminary gave their annual Hallowe’en reception, the same being in reality given by the Senior Class. A large crowd was in attendance and the occasion was thoroughly enjoyed by all who were fortunate enough to be present. The whole spacious building was decorated suitably to the occasion celebrated. Upon entering a weird and “spooky” cast was observed and an appearance of semi-gloom pervaded the halls and room and the whole atmosphere. Autumn leaves of variegated colors decorated doors, windows, alcoves and pictures, and orange and black pennants, streamers and papers garnished with witches, black cats and ghosts were in evidence everywhere. In the Assembly Chapel these emblems were most prevalent, and piles of dead leaves covered the floor, while a carpet of the same was spread in the lower hall. Each guest, upon entering, was conducted up “Spook Alley,” where all were pursued by spooks and witches, these being different members of the Senior Class, masked, as was the whole student body. All the costumes were especially attractive. After leaving the place of spooks the guests were ushered into the Chapel, where a fantastic witches’ dance was performed around a blazing fire in the witches’ cauldron. A contest was then held which evoked much fun; while in one room and the lower hall a Gypsy told fortunes and a witch, in a leafy corner, gave out slips of paper upon which were inscribed other fortunes, all to be had for the asking. About 10 o’clock students and guests were ushered into the dining hall, which was beautifully decorated, where an elaborate luncheon was served, the guests being waited upon by members of the class robed in the Hallowe’en colors. Of course, the students of the Mt. Pleasant Collegiate Institute attended in a body, as they never miss an opportunity to mingle socially with the young ladies of the Seminary. Among out-of-town guests at the Hallowe’en Reception at the Seminary were Mesdames Tavis, from Winston-Salem; Wilkinson, from Concord; J. R. Henderson, from Charlotte; Mr. and Mrs. Ernest R. Hood and the Misses Eleanor and Jesselyn Houston, also from Charlotte.